Below are several ideas for you. Composting is more art than science. It can be as simple or complicated as you make it. You can compost a open pile of organic material or you can compost in a closed purchased container or you can build your own. There are many many examples on the internet - below are some of my favorite designs that you can build. Lowe's: "This two-bin composting system can be built by one person in about five hours...."
version of the plans Sunset Magazine: "It's inexpensive, easy to build, and features five stackable sections for simple, efficient composting..." Fine Gardening: "My own homemade compost bin is easy to assemble and disassemble and works with whatever size compost pile I have at a given time...."
around the yard..." "What you will need for this project is 4 shipping pallets that are roughly the same size, 4 L brackets, 2 strap hinges, a latch and the screws to attach the hardware..." "Building your own bin is a great way to customize a system to fit your composting needs..."
effort to build...." Use a garbage-can to make an inexpensive composter. Simply remove the bottom and drill holes - ready to use. Recycle that old snow-fence. (at least 8" deep). .
One Bin Systems: A one bin system is the easiest way to make a compost pile. This is a good system if your organic sources are limited or your space is limited. The construction is basic. Make an bin that is at least 3 cubic feet. You, of course, have the option to compost without a bin at all by just piling organic material directly on the ground. 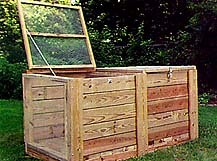 The basic one bin system can be constructed from free wooden pallets, cinder blocks, metal or wooden posts, etc. You can "wrap" your bin with chicken wire, snow fences, or lumber. 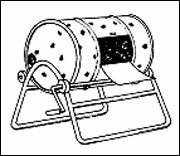 Two Bin and Three Bin Systems: This system consists two or three adjacent bins. Each bin contains compost in various stages of decomposition. Rotating or Tumbling Systems: These for the most part are commercially available. When everything is in order, your compost should be done in about three weeks. you fill the container only partly full with both greens and moistened browns. The key to successful composting in a rotating system is to not overfill the container. A half-full container tumbles more easily. 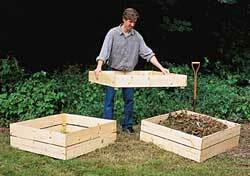 Sheet or Trench Composting: A alternative to pile the compost on the ground. With this system, you bury the organic material in 8" deep trenches. The easy part is that you bury it and forget about it. You just bury the organic material, let it decompose for a few months and then plant in the trench. My dad spread fallen leaves on his spent vegetable garden and then turned them under with his little tractor. Joy Blooms . . . Compost It!